Clifford Electric has enjoyed a wonderful working relationship at the Boston Yacht Club in Marblehead, MA for many years. Most recently we installed a new lighting system in the busy kitchen. The Chef couldn’t have been happier with the service. Not only did the kitchen staff enjoy the wonderful new lighting, they were also pleased that Clifford Electric did not interrupt their busy lunch and dinner rush while installing a major lighting upgrade. Also installed were some new lighting systems throughout the club’s main dinning room and lounge areas. The membership was appreciative that they were never inconvenienced during the project and are now enjoying the well lit spaces. “Who you gonna call,” Clifford Electric! When a home owner called us and asked us if we could install some lighting to better illuminate her painting of Bill Murray, we had no idea what she had in mind. After meeting with the home owner we knew this was going to be a fun project. The challenges of this job may have been too much for some electricians but not Clifford Electric. We took this comical lighting job very seriously and delivered an end result the customer was very pleased with. Working at Northeast Animal Shelter, we wired large scale outdoor lighting and security systems. Inside we installed new lighting, audio interface and speaker systems, as well as internet and security monitors. Commercial electrical projects are always done with the utmost professionalism. 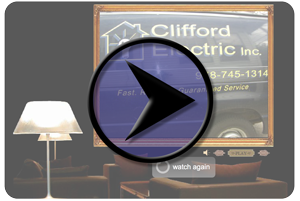 While some contractors have a reputation for leaving a job site unfinished or a total mess, Clifford Electric will not! We pride ourselves in being one of the most courteous, professional, and tidy contractors in the business. Whether it’s a commercial space or residential home, we always leave the space as clean as we possibly can.